Soooo. Yeah. This is pretty dang gross. I mean, in my mind I was like, it will be so creepy and awesome and I HAVE to do it. 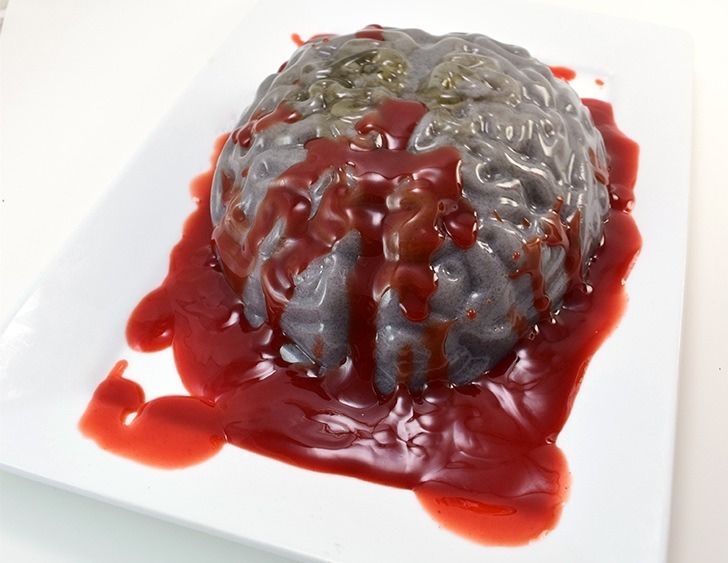 But when the reality of my bloody brain jello Halloween treat came to be a jiggly reality I must admit, I totally grossed myself out. Like, TOTALLY GROSSED OUT. 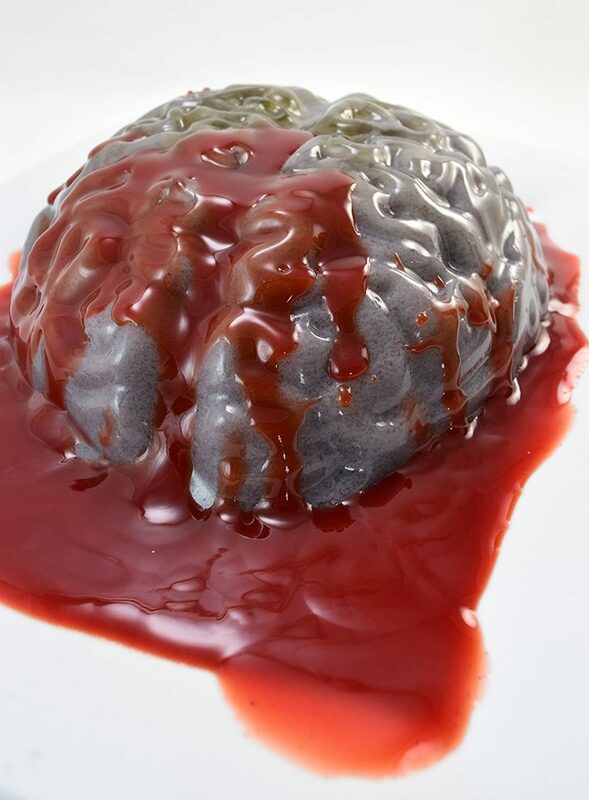 And, yet, I’m totally in love with this bloody brain jello because it worked! In truth there’s no way I’m going to google an actual human brain to be able to tell you the difference because some things you just can’t unsee so I didn’t do that… But as far is it goes in my mind? This is freaking bang on totally realistically and grossly bloody brain-like! I’m sure it has something to do with those deep grooves in that mold. 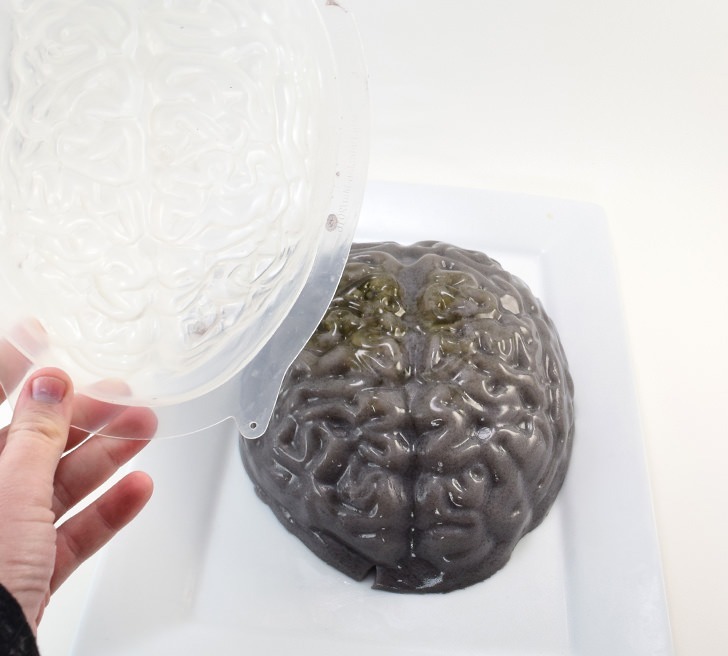 I knew when I found this brain gelatin mold on Amazon that this was a MUST DO situation. I mean, I already had a bloody brain recipe in the works but this one seemed BIGGER and GROSSER and therefore more awesome. So while Rob was driving around town in his bright red car I was envisioning bright red plates of chamoy covered mango gelatin. If I’ve learned anything from living in South Texas it’s that mango and chamoy are TOPS! Have Rob and I tried a bite? Yes. And it tastes really good. Have we had a second? Not yet. Rob, like Mikey, will eat ANYTHING but we’re both a bit too grossed out for a second helping :) In truth, I almost didn’t share this. I’ve held off week after week pushing it back but then I realized… it’s for Halloween. And Halloween can be creepy and gross. 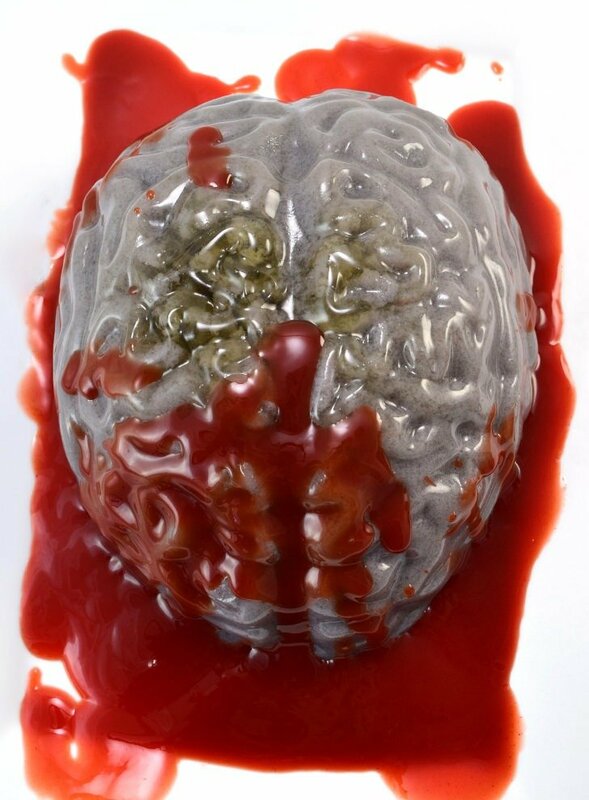 So here I am grossing you out on a totally and otherwise fine Wednesday because I’m sure that a bloody brain jello like this one is going to be the biggest hit at your Halloween party, or heck, maybe even a zombie themed wedding. What? It freaking happens! I was pretty stoked about making this, if nothing else because I’d get to try out my new Electrolux electric kettle I got a as a gift. I’m more and more into hot drinks as the seasons change (although the weather doesn’t seem to do JACK around here, dangit!) so hot water on demand is pretty nifty! To ensure that you get your gelatin out in one piece since the grooves of the mold are pretty deep, I’d highly recommend rubbing vegetable oil inside of the mold for super easy release. Now Rob couldn’t find mango gelatin for me so we used watermelon, also tasty with chamoy. 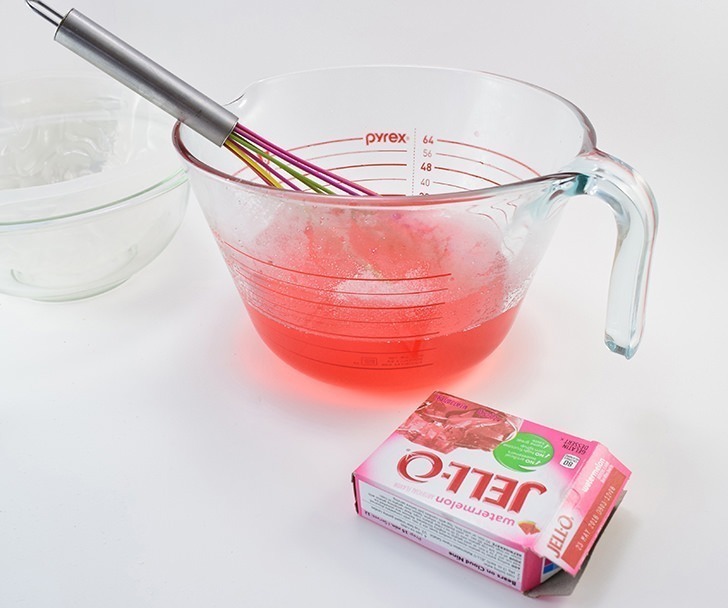 Place 3- 6 ounce boxes of Jello into a heat safe bowl and add 3 cups of boiling water. 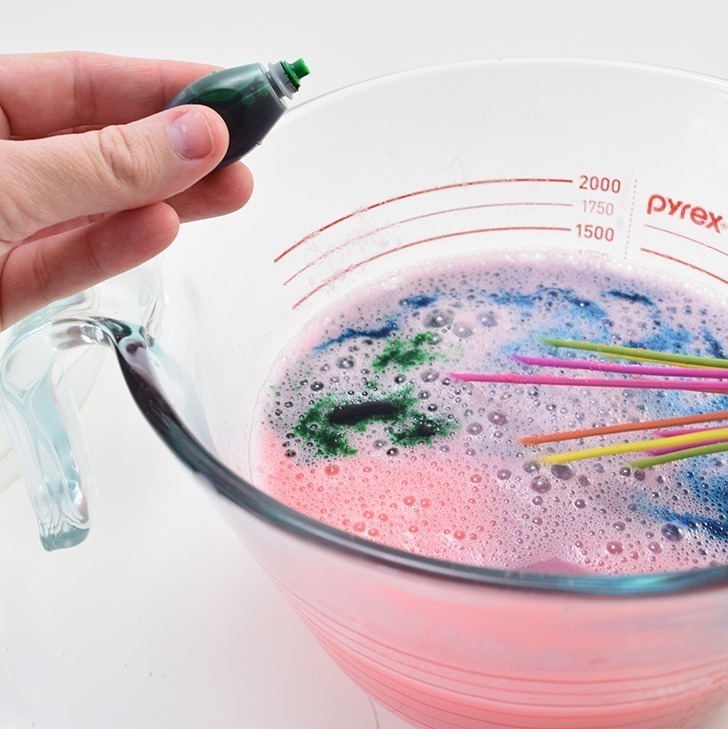 Stir several minutes or until the granules have all dissolved. Add 2 cups of ice cold water and stir. Make the gelatin opaque by adding milk. 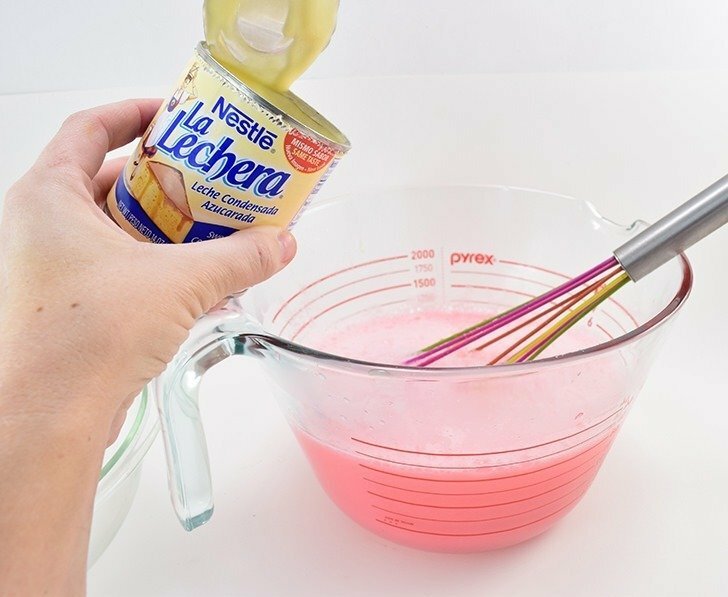 I used approximately half a can of sweetened condensed milk but you can also use milk straight from the fridge. I haven’t tried nut milk for the lactose intolerant but I don’t see why it wouldn’t work out just the same. 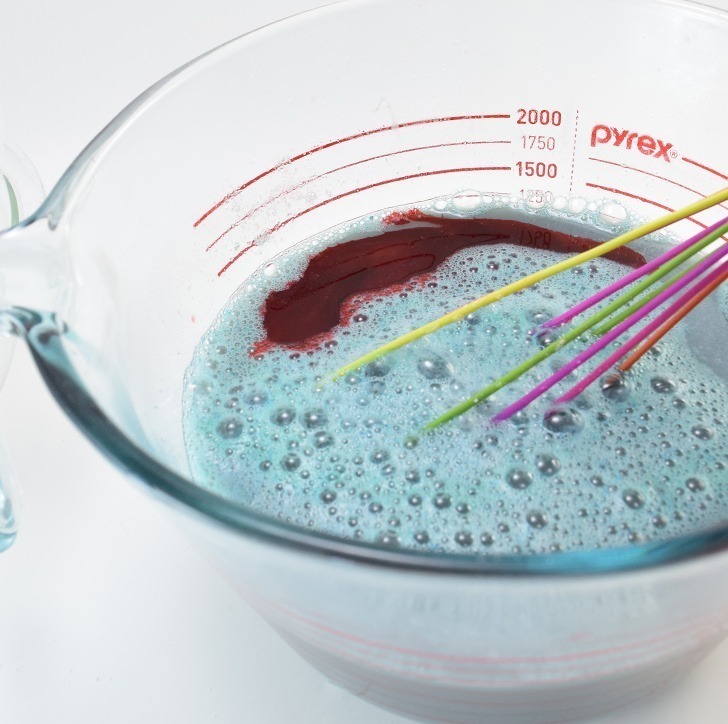 To make your pretty pink into that creepy gray color first add 12 drops of blue and 12 drops of green food coloring. Mix well to discern the color. Pour your mixture into your mold. 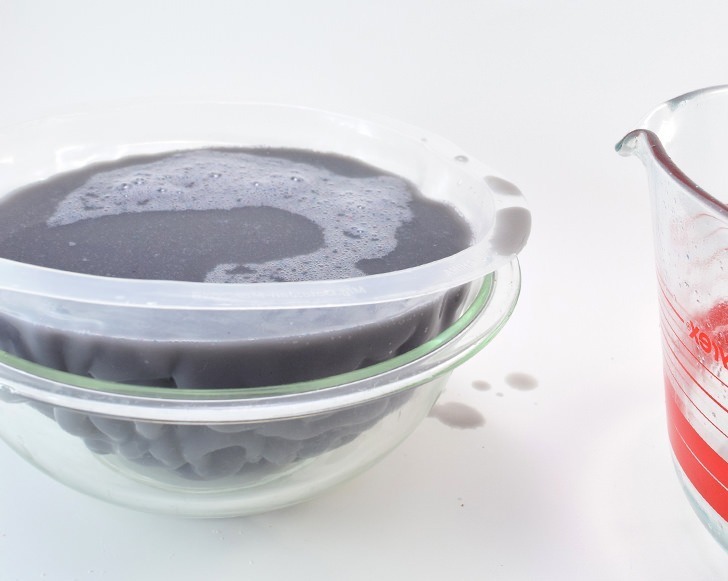 For easier moving about and general use you can place your mold inside of a bowl so that it doesn’t tip over on you. Now see how I have about an inch left to fill? I didn’t use enough cold water from the get go to fully fill my mold and so I just poured enough yellow colored water for it to lift to the top while it was sitting in the fridge after it had started to set for about 30 minutes. 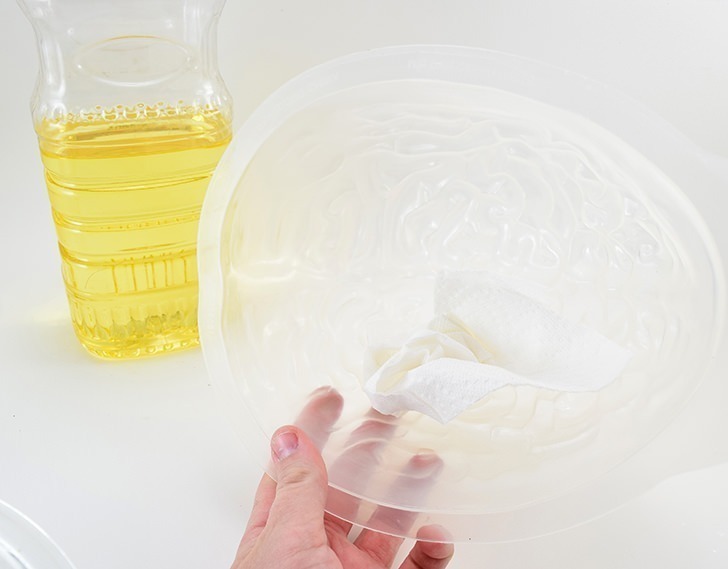 Gently unmold your jello onto a simple plate. If you need helps unmolding I have a tutorial for that! 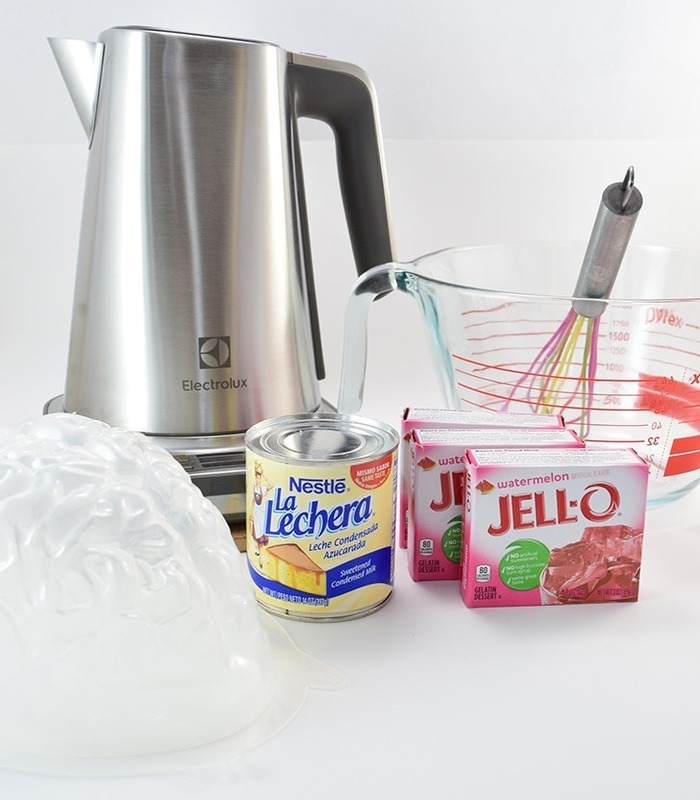 How to Unmold Gelatin. Now look at that thing. It’s already pretty dang creepy but we’re about to up the ick factor with chamoy. 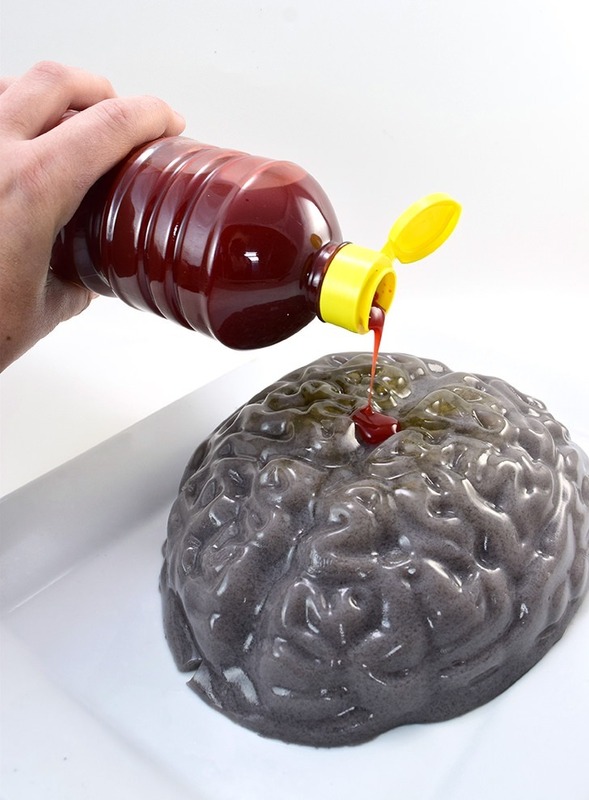 Simply pour chamoy or candy blood onto your brain and the plate surrounding it to finish this bad boy up. What is chamoy you might ask? It’s this super tasty fermented fruit sauce that is sweet, salty and tangy at the same time. It is an acquired taste and one I am a big fan of these days. It’s common down here near Mexico and you sometimes get your fruit with chamoy unless you think to ask for it without it. If chamoy doesn’t sound like your thing you can also use a candy that looks like blood. At Walmart they sell little vials of the stuff. 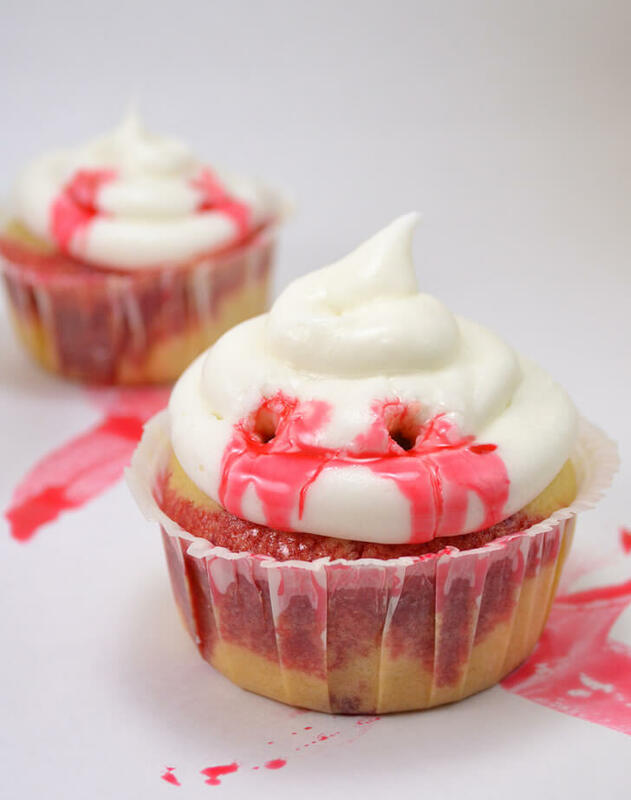 I actually used it to make vampire’s bite cupcakes last year that are going to be on the cover of a dirty romance novel soon! (gotta love the diversity readers of this blog, for sure! :) I also found this recipe for blood used on bloody candy apples over at 1 Fine Cookie that are AMAZING looking. *** UPDATES! 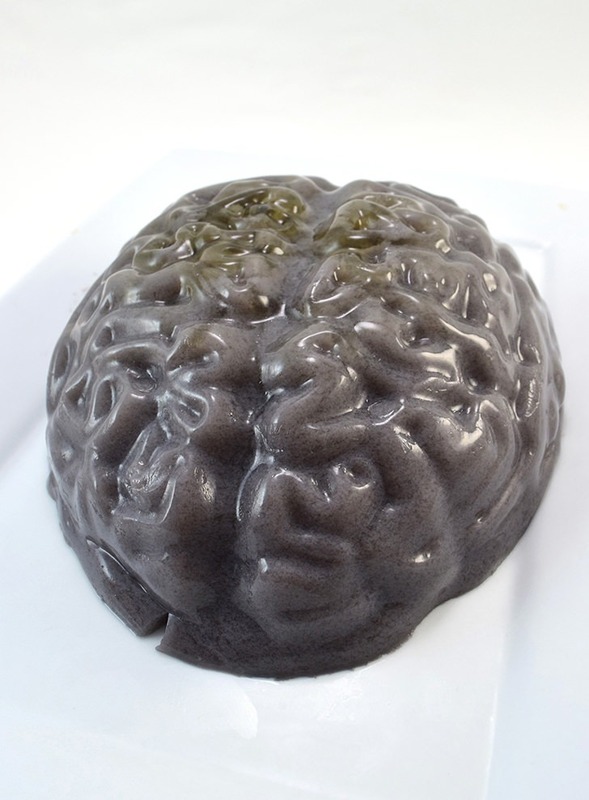 I’ve since found brain gelatin molds at Walmart for $2. The grooves aren’t as deep so it may not look quite as creepy but, come on, 2 bucks. I’ve also since found this red velvet cake which is way more gross than my jello, I think! Ew!